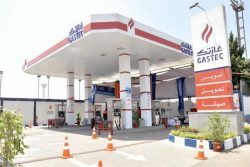 Egyptian natural gas vehicle conversion company Gastec and Italy’s energy major Eni have signed an agreement to establish multi-fuel (liquid fuels/natural gas) fuel stations in various areas across Egypt, particularly in Upper Egypt, to serve owners of natural gas-operated vehicles. The agreement was signed by Gastec’s president Eng. Abdel Fattah Farhat, their technical director and managing director Eng. Stefano Chesi, and Giuseppe Richie, head of refining and marketing for Eni. According to a press release issued Monday by the Egyptian Ministry of Petroleum and Mineral Resources, Minister Tariq Al Mulla intends to expand CNG refueling infrastructure at vital locations and encourage the demand for the conversion of vehicles to CNG. Eni owns 40% of Gastec and the new stations will have Eni branding. Minister of Petroleum and Mineral Resources Tariq Al-Mulla says about 248 thousand cars have been converted up to the end of last August. The number of CNG fueling stations currently operating is 183; Gastec is in the process of inaugurating three new stations. Eng. Abdel Fattah Farhat pointed out that an agreement has recently been signed with ENI by Gastec for exclusive distribution rights for ENI’s oil products in the framework of contributing to the provision of specialized petroleum products to the local market. Gastec is ranked the first in Egypt among NGV companies in terms of its gas sales and number of converted vehicles. He added that Gastech has prepared an implementation plan for the next five years to establish integrated stations with a total of 50 stations at an investment cost estimated at EGP 600 million (USD 33.5 million) in many cities and governorates including Cairo, Alexandria, Central Delta and Upper governorates, Canal, Sinai, Red Sea and main roads between governorates. In Egypt, shifting from conventional fuel to natural gas is seen as an effective measure to avoid liquid fuel shortages caused by diplomatic conflicts and international affairs. Gastec is the sole company affording cylinder-testing service to the customers of all the NGV companies in Egypt through its service centers countrywide. The number of CNG cylinders tested up to June 2017 amounted to 172,858 cylinders. Sources: Arab Republic of Egypt – Ministry of Petroleum; Gastec.